INDICATIONS: Escharotic, dehydrating and sclerosing agent. 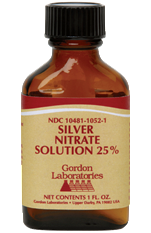 ACTIVE INGREDIENT: Each fluid ounce contains 7.5 grams of Silver Nitrate. DESCRIPTION: Colorless, odorless, transparent solution used as an escharotic, dehydrating and sclerosing agent. PHARMACOLOGY: One of the cauterant chemotherapeutic methods employed. Slower activity than 50% solution; discretion is left up to the Physician. In treating pruritus, the moist and macerated, perianal and intergluteal dermatitis is best treated with desiccating agents such as Silver Nitrate Solution. CONTRAINDICATIONS/WARNINGS: Prolonged or frequent use may result in a permanent discoloration of the skin. Federal law prohibits dispensing without a prescription. FOR PHYSICIAN USE ONLY. Keep out of reach of children.